That’s probably for the best though, because this knife is no laughing matter. Despite the goofy name the CRKT Shenanigan is a seriously well thought out knife at a price that you would be silly to ignore. Designed by Ken Onion, and manufactured by the good folks at CRKT, the Shenanigan brings great utility to anyone willing to cough up enough money to cover the very modest $35 price tag. While the knife is by no means perfect I think that the good here far outweighs the bad. The Shenanigan sports a 3-1/4″ blade and an overall length of 8-1/4″. CRKT claims that the PPS (plastic handled version) weighs 4.1 ounces, but in my hand it feels much lighter. I’ve seen listed weights fluctuate from 4.1 all the way down to 3.7 ounces, and I’d put it closer to 3.7. Anyhow, not like that really matters too much, but my point here is the knife feels light for its size. It is a bigger knife, straddling the gap between EDC and tactical. Depending on your preferences I think it could lean either way. The blade is a long and elegant modified-drop point design with a slight recurve and a swedge. The blade shape is one of my favorite features of the knife. The recurve, high hollow grind and good belly are all excellent for slicing, and the reinforced tip enables good penetration. CRKT did a very nice job with the edge; it is both well ground and extremely sharp from the box with an almost mirror-polished appearance. The blade’s good looks have been rounded out with a bead blasted finish and laser etched hallmarks. Blade steel on the Shenanigan is tried and true AUS 8. For a knife at this price point I am very pleased to find AUS 8 here. A good mid range steel from Japan, AUS 8 easily takes an edge and holds up well to EDC tasks. The Shenanigan PPS gets its name from the PolyPhenylene Sulfide (PPS) polymer that has been used for the handle material. This is some sort of highly engineered plastic, and it didn’t take a chemistry degree to figure that out. The PPS material is both lightweight and durable and is part of what enables this knife to be had at such a great price. CRKT set out to make a high value work horse, and I think this material selection fits the bill. The PPS is dense enough to feel satisfying and is virtually indestructible. Inside the handle are some partial steel liners adding strength and rigidity to the design. For those that would like an upgrade to the handle material, CRKT offers just that. An aluminum version is also available if you absolutely cannot stand the idea of carrying around a plastic-handled knife. I think for many people the PPS will be totally sufficient as the aluminum scales almost double the price, but I’m really tempted to check out this upgraded version as well. Ergonomics are excellent with the Shenanigan. First of all, it is a larger knife, and there is a good amount of palm swell to fill the hand. Curvature to the handle design allows for a precision fit into the palm. Meaningful texturing adds grip and feedback. Additionally, there is a good deal of functional jimping on the thumb ramp and the choil is large and well placed. The net result is that the Shenanigan is extremely comfortable in hand. Unfortunately, the many things that make the Shenanigan so great in hand work to make it not so great in pocket. Being a longer knife I found the Shenanigan to take up a good deal of room, and the thick handle made it a bulky carry as well. Certainly this won’t be a problem for folks who like to carry a bigger knife, but the size and thickness could be a turn-off for those who want to streamline their EDC. I will say, the pocket clip position doesn’t do the knife any favors. It’s mounted for right side tip down carry only. I’d love to see CRKT make this a 4 corners clip, or at the very least allow for tip up carry. That said, I found retention on the Shenanigan’s clip to be nice and snug. It’s a discrete looking clip that rides low and looks pretty good. Some will be surprised to learn that the Shenanigan is not an assisted open knife. Ken Onion is famous for designing assisted open folders so it could be easy to assume that the Shenanigan would feature a spring assist as well. This one does not have a spring assist however, and you need to use a flipper to get it open. The blade still deploys fast and smooth, with a combination of nylon and bronze washers inside. I don’t miss a spring assist at all with the Shenanigan. The blade jumps open with very little effort. The Shenanigan uses a liner lock to hold the blade open. First impressions were that the lock looks kind of thin. Upon closer inspection I think it should work for EDC and utility tasks, but for harder uses I’m not as confident. Then again, the handles are made of plastic, so I wouldn’t suggest hard using this one in the first place. I got to play with two Shenanigans and both had good engagements. One had no blade play at all, the other had a slight amount of play (or an off-center blade – could never get it to balance 100% perfectly). For a $35 knife the lock meets my expectations, but if you can visually inspect the knife before purchase I’d go ahead and do that. Ken Onion really hit this one out of the park when he designed this incredibly comfortable and functional knife. If you need big utility out of a small budget blade, I think there is a lot to like with this one. Stuff that I really liked included the blade shape, the steel, and the ergonomics. I wasn’t quite as wild about the position of the pocket clip, and found the lock bar a little on the thin side given the size of the knife and its potential purposes. 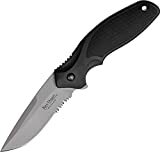 I recommend buying the CRKT Shenanigan at Amazon or BladeHQ. Please consider that purchasing anything through any of the links on this website helps support BladeReviews.com, and keeps the site going. As always, any and all support is greatly appreciated. Thank you very much. I want to thank my buddy EdgeObserver for sending me this knife for review. It was a very thoughtful gesture from a very discerning knife reviewer. He did an awesome job with his own take on it, even going so far as to take the whole knife apart. Be sure to check out his review and get yourself a good second opinion on this blade. I bought one of these a little while ago. I liked it for the ergonomic handle shape. It really works. Hey Greg, glad to hear we see eye to eye on some of these finer points. If the knife was assisted I could perhaps understand some safety reasons for tip down only, but I think this knife would be fine tip up. Thanks for reading and offering your thoughts. When I first saw this, I thought, “This looks a lot like the Kershaw Blur”. Didn’t take long to see that this was a Ken Onion, which explains it. Definitely a much cheaper option if you like the looks and design of the Blur, but don’t plan to use it for EDC. Yeah, the Wal-Mart version of this knife is apparently only $30 these days. Nice little Ken Onion design for 30 bones – not bad at all imo.